SHOWN WITH 99 C-7 INCANDESCENT GREEN & RED LAMPS. COMPLETE WITH STANDARD GROUND MOUNT HARDWARE. THIS DISPLAY IS STATIC. 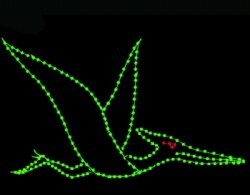 ALSO AVAILABLE: 7' x 8' STATIC PTERODACTYL HAS 131 C-7 INCANDESCENT LAMPS @ 655 WATTS & 58 LBS. 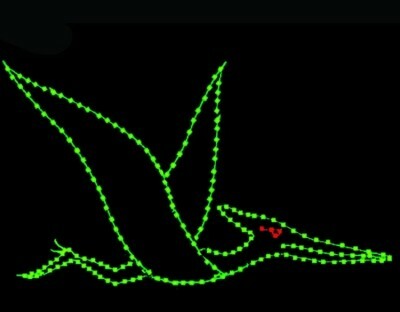 10' x 8' ANIMATED PTERODACTYL HAS 198 C-7 INCANDESCENT LAMPS @ 990 WATTS & 86 LBS.